CHROMA Haiku Kurouchi are part of the prestigious TAKUMI ranges of CHROMA knives! A decidedly reasonably priced debut to the world of extremely sharp knives Even fresh out of production, the sharpness of the blade will take your breath away. With regular use of a good sharpening stone, as with all TAKUMI knives, you will see that the cutting performance of what you thought to be an ordinary kitchen knife will rise to never before reached levels of sharpness. Suddenly the slicing of radishes or carrots becomes an experience in and of itself. This is made possible by the unique design of the knife’s blade. A “sandwich construction” that is made up of extremely hard, blue AOKO Steel at the center, and then finished with protective layers of consecutively softer iron. KUROUCHI knives owe their characteristic, archaic nature to their birthplace – the Tosa region of Southern Japan. The Tosa Region is known for its long tradition of forging knives, and also for its wild, raw and furrowed landscape, which lends its spirit to the KUROUCHI blade and gives this knife its unmistakable, untamed nature. After it has been forged, the blade of the CHROMA HAIKU Kurouchi is left raw and unpolished; only the cutting edge glitters metallically. Translated from the Japanese, Kurouchi carries a meaning similar to “black-forged”. Because of its artful hand finishing and somewhat primal form, we are proud to call it the “Ur-Messer”, which translates to “Original knife”. The Kurouchi knife is, so far, the only knife which fully meets the strict requirements of the CHROMA inspectors for a TAKUMI knife without being manufactured in SAKAI. It was actually quite by chance that the little blacksmith’s shop was discovered by a CHROMA employee in the rugged Tosa region of Japan. At that time, the blacksmith thanked him for his interest by giving him a knife as a present. CHROMA HAIKU Kurouchi knives meet all the requirements of a TAKUMI knife. 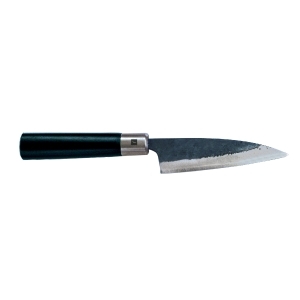 Upon delivery, the blade already possesses a breathtaking keenness, and, as with all TAKUMI knives, by regrinding with a good grindstone, its cutting capacity can be raised to a level that is practically unattainable for traditional kitchen knives. Cutting even carrots or radishes thus becomes a real experience. This is made possible by the special design of the blade. A “sandwich construction”, produced with a core made from extremely hard, blue AOKO steel which is subsequently protected by softer layers of iron, makes it possible to achieve an optimal hardness of 61° HRC at the cutting edge.